Do you need something to accompany you watch your favorite TV serial and spend quality time with your family? Why not trying BBQ Chicken Pizza Dippers. This easy dinner and tasty recipe will not only cheer up your children but also adults around you. In addition, this recipe is easy to make and you will only need less than an hour to complete the process. So, what are you waiting for? Let’s make it! 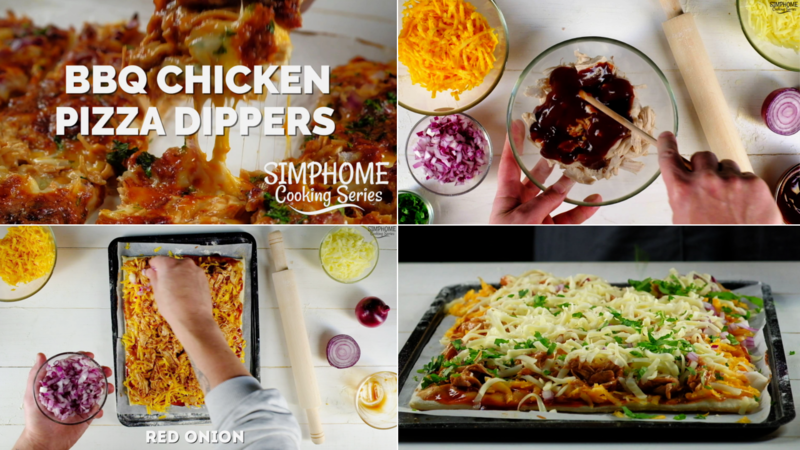 To cook this BBQ Chicken Pizza Dippers, there are some materials and ingredients needed. To give you peace of mind, they are easy to find and you might have already had in your fridge. Here are all things that you need to create this delicious homemade pizza. Once you have prepared all the materials and ingredients needed to create the BBQ Chicken Pizza Dippers, now it is time to cook. Just do the following instructions. First, you need to prepare a pan. Put two glasses of water in the pan and then boil it. After the water is completely boiled, put salt, pepper, and bay leaf for seasoning. Leave them for a minute. Next, you need to prepare 2 big skinless and boneless chicken breast halves. Put the chicken into the seasoned boiled water. Leave the chicken and cook until it is ready. For the next step, you can prepare pizza dough and put it on a plate. Bake the pizza dough for about 10 minutes at 400 Fahrenheit degree or 200 Celcius degree. Bake until the pizza dough is ready. While waiting for the pizza dough to be ready, you can prepare a big bowl and then take out the seasoned boiled chicken. Shred the chicken breast halves into little pieces and then put them on the bowl. Let the shredded chicken breasts dry and then put BBQ sauce in the first small bowl on top of the meat. Stir them till the meat and BBQ sauce well blended. Set it aside for a while. Prepare another BBQ sauce in the second small bowl and then apply it on the baked pizza dough thoroughly by using a tablespoon. Put grated cheddar cheese on top of the pizza dough. Cover every inch of the dough with the cheddar cheese. After that, you can put the shredded chicken meat with BBQ sauce on the pizza dough. Then add onion, mozzarella cheese, and chopped parsley above the meat. Then bake the pizza dough once again for 10 minutes at 4000F or 2000C. Your BBQ Chicken Pizza Dippers is ready to serve. Cut the pizza into some square shapes and serve while they are still hot.